Joyce, a guest to Diana's Desserts website made these lovely sugar cookies, and said "they are wonderfull", and when she made them, the recipe made about 4 to 4 1/2 dozen (2 1/2 to 3 inch) cookies. Cream together the butter and sugar until smooth. Beat in the eggs and the vanilla. Mix together the flour, salt, and baking powder. Fold the flour into the butter mixture. Roll the dough into balls and place on a cookie sheet lined with a baking mat. Dip the bottom of a drinking glass in sugar and press the cookie balls to a quarter-inch thick. Bake at 400 degrees F (200 C) for 8-10 minutes. 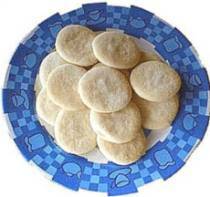 Makes approximately 4 to 4 1/2 dozen (2 1/2-3-inch) cookies. best cookies I have ever baked!! These were great and SOOO easy to make. I'm a newbie at baking and even these I couldn't mess up. GREAT recipe! They were good but they could have been better. YUM! The only problem with the recipe is that the dough doesn't turn out as well when you fold the flour in. I just added it into the mixer like any other ingredient, and mixed for 3-5 minutes. They turned out DELICIOUS. OMG i have never tasted any cookies this awsome!!!!!!!!!!!!!!!!!!!!!!! !These were great and SOOO easy to make. I'm new at baking and even these I couldn't mess up. Awsome recipe!best cookies I have ever baked!! These cookies are extremely good! My family loves them so much! Thank you for the great recipe! I didn't like these too much. I found them too thin, but again it might be because I only did half the quantity. These are horrid! i dont know how you can even taste these! My 24 year old daughter who is in cullinary school says you bake them very wrong! My 11 year old daughter loves these! I used salted butter since I didn't have the unsalted on hand. These have always been wonderful! I've made them many times, but today I decided to add about a 1/2 tsp of orange zest. It just adds that "something extra"! Next time, I'll add more! I cut down on the amount of sugar in the recipe and added a little strawberry extract. It turned out extremely good. My friends said that the cookies taste like 'hello panda'(biscuits). Veryyyyy good. My husband, my son and my neighbors love them. One BIG tip. DO NOT USE REDUCED FAT BUTTER OR MARGARINE TO MAKE THIS BATTER. After baking this recipe many times to great success, I accidentally bought reduced fat margarine and it completely ruined the recipe. It basically ruined everything I did after that.